A recently published study from the University of Alberta, Canada, examines what happens when binary stars come together. 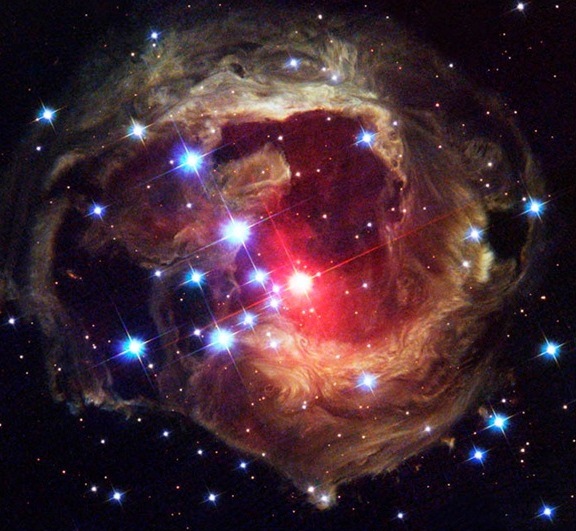 The research, published in the journal Science, has also shed 'light' on where mysterious cool and red outbursts, called intermediate-luminosity red transients, originate form. 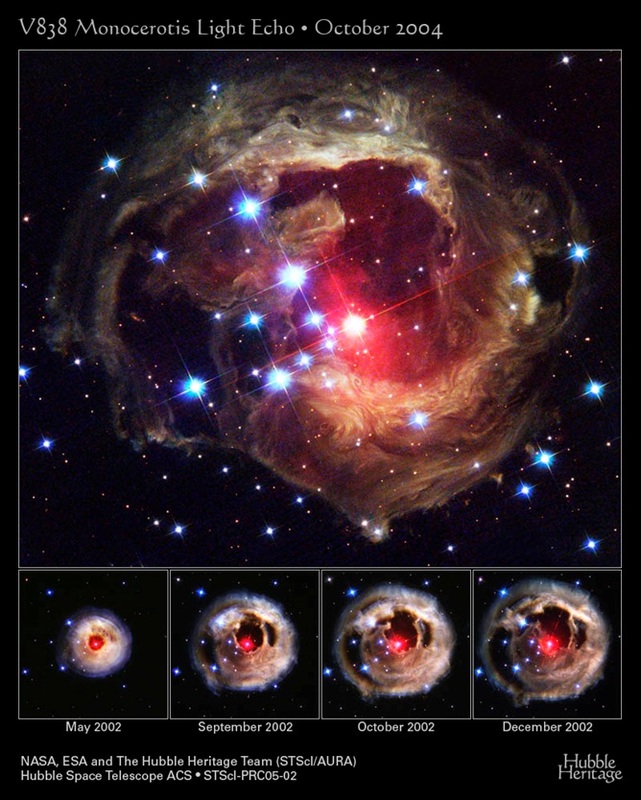 One ILRT thought to be explained by the mechanism isV838 Monocerotis censoris, which experienced a cellular outburst in 2002. Image courtesy NASA, ESA, and The Hubble Heritage Team (STScI/AURA). Some stellar outbursts are brighter than novas but dimmer than supernovas. Intermediate-luminosity red transients or ILRTs have a luminosity (or brightness) that falls between that of the two more well-known stellar explosions. They also appear red in the night-sky instead of blue. At least one ILRT is discovered every year but the origins of ILRTs still thwart stellar researchers. One theory is that they could have resulted from a dynamic unstable exchange between two binary stars that share a temporary envelope (referred to as a common envelope event or CEE). Recently, researchers from the University of Alberta, Canada, have shown direct evidence for this idea, through computational models. Since the 1970s, astrophysicists have debated what happens when binary stars come together in a 'common envelope'. 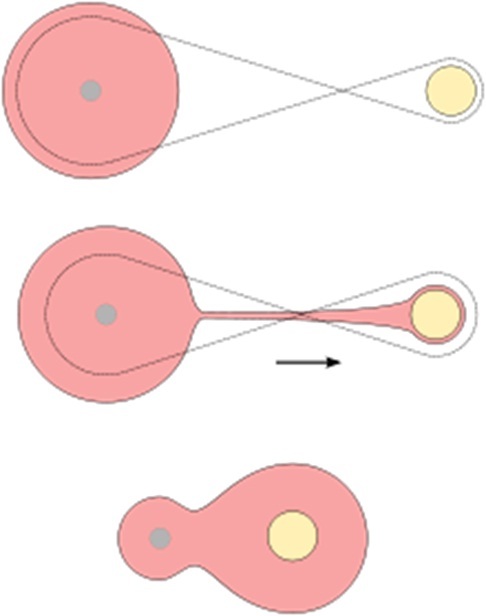 When a common envelope event occurs, the larger of the two stars (the donor star) initiates unstable mass transfer - a dynamic and run-away process - to its companion star. Theoretical astrophysicist and lead researcher of the Sciencestudy, Natasha Ivanova, was interested in finding out what a common envelope event would look like. "If it looks like a big star you can't really find it in the galaxy amongst a zillion stars. So we started to think about what would happen when a common envelope ran away from the star. Then we figured out that the envelope's material will start to recombine (a process involving cooling of a hot plasma in the stars) and release energy, and then that energy can act as an observational signature," she says. The red giant (red, left) fills its Roche lobe (dashed, green line) and begins transferring mass to the main sequence star (yellow, right). As the mass transfer accelerates, the core of the massive star (gray) and the main sequence star become engulfed in a common envelope. Image courtesy of Wikimedia Commons. Ivanova adds that previous evidence for common envelope events was indirect, mainly through observations. Observations of CEE are difficult as it can be rapid (often over in a month) or more drawn-out (lasting a few hundred years). The researchers at the University of Alberta carried out astrophysical modeling with 3-D fluid dynamics simulations to study the stellar outbursts. This involved using smoothed-particle hydrodynamics (SPH) techniques to calculate the 3-D interaction of the stars. The method, also used in ballistics and oceanography, is routinely used by astrophysicists as it can simulate phenomena covering several orders of magnitude - from the formation of stars to galaxies. The specific code, StarCrash, helps construct the initial conditions appropriate for stellar collisions. "Each star is modeled by 50,000 to 170,000 particles. "Each simulation 'production-quality' run would take a few GPU years, and we had about several dozen of simulations with various initial conditions to carry out," said Ivanova. The simulations used 20 GPU-core years from WestGrid (Western Canada Research Grid) resources. The research also benefited from other smaller clusters using around 40 GPU-core years in total. In early 2012, a much larger GPU-based computational capability became available at WestGrid. Ivanova explained how the simulation works in more detail. "We take two stars in 1-D (as we normally evolve stars as being spherically symmetrical), and then we place it in the 3-D quad and relax it, and then we place it in binary orbit and we let it go. What we are trying to find out is how much material can be ejected and how much energy can be released. You can then find out what the light curve might look like", says Ivanova. Column densities as viewed perpendicular to the orbital plane and at times after the merger. The merger causes an outflow of material, with the field of ejecta dropping to lower and lower densities and column densities as it expands. At late times in the simulation, while the ejecta continues streaming outward, the bound merger product in the center of the system gradually reaches larger column densities as more material falls back to its surface. Video courtesy James C. Lombardi Jr. using SPLASH (Price 2007). The simulations reproduced the outburst. What they found was the hot and ionized material in the common envelope cools and expands, then releases energy in the form of a bright, red outburst of light. "We found that some material can become unbound to the system (meaning it can run away to infinity) and while it runs away, it cools down producing this recombination wave which we observe as an outburst". The simulations, in fact, showed how much stellar material is ejected and how fast this energy was released, highlighting the similarities between CEEs and the ILRT. In addition to simulations, the researchers also carried out a simplified analytical model comparing basic properties, such as the overall duration and overall brightness. The energies, colors, short time scales, ejection velocities of ILRTs, as well as the rates at which they happened, match those of the predicted properties of long-sought common-envelope events. This new model applies best to a subset of ILRTs often called luminous red novae. "It is a very important event because theoretically CEE is vital for producing many other kinds of interesting systems, for example: Type Ia supernovae, short gamma-ray burst progenitors, X-ray binaries, close double neutron stars and many more. It is the first direct link between the event itself and observations and it is exciting that we can perhaps start soon testing the physics of something that until now was only very indirectly thought to happen," says Ivanova. Her stellar journey continues as the group intends to continue modeling the evolution of CEE and to examine the sequence of events that lead to two stars transferring energy.